activate the esp in your mod manager of choice. Here is the playable race and companion mod, that use Robert's male and female bodies. For boys and girls, 12 Skysims hairs (originally marked as male ones, but they're mostly unisex, imo) converted by Max to Oblivion. I've collected 9 of my eyes that fit the skin best, including black and blanc eyes, cat large eyes, and doll eyes. Gill and Gillian are chilling out in Mara's chapel of Bruma. These are very pale skins with no body hair, scarred in the most enjoyable way. Gill holds a secret diary in his inventory. Read it. You'll be impressed. Our pale tester boy's name is Brian. He is showing up here assisted by Max. Max's interest in torturing the model has led to the unfortunate results. The picture series kinda illustrates the story that was written down in Gill's diary. Therefore we make up a conclusion Gill and Brian were the same person. Face detail.. isn't Dustin god? don't you reveal our secrets. ahh I really enjoyed testing this race!dustin your brian is phantastic,this is true!do you want more screens of the jelly angels as well?or any other of your new races? Guys you two are awesome! This set of screenshots using the pale victim skin is creepy! 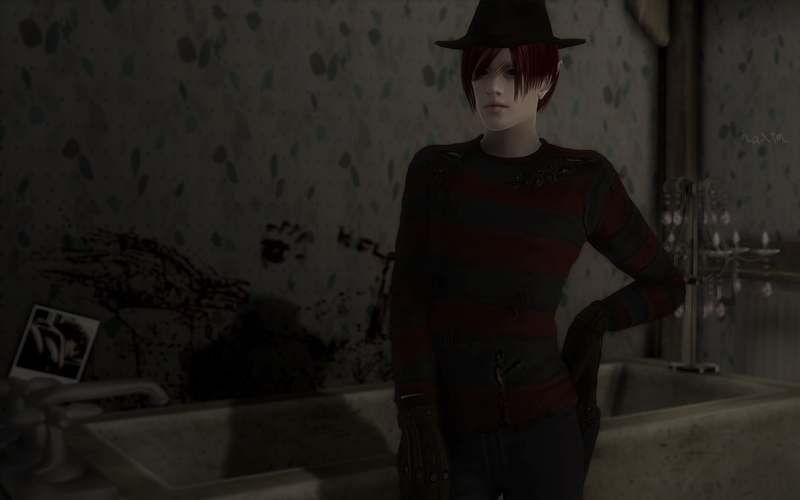 Freddy's outfit fits in perfectly and makes it even more disturbing! haha thank you very much guys! max, yes i'd love more pics of anything from you. but the pics you sent me previously are the ones i will release in the public upload of them i think. they're so great. and you're so right peter, the freddy outfit is so perfect on this skin! dustin i decided to make some new pics for your jelly angels. because i forgot to put those adorable huge ears on them! now that i ve put them on, the race looks even better i think. so be patient! im planning on finishing this today. ah, i need to repair those ears... they look holey from the back, lol. i need to learn how to use the conformulator and give them the proper egm files too. those ears are cute though, right?? 6) put it where ears.nif goes and you're done. Here is picture of my pale victim character ^^ thanks you for making this lovely race! and of course thanks for house it's lovely too.